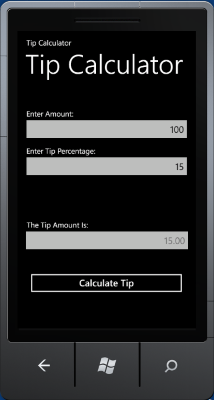 The DigiOz Tip Calculator is an application that allows you to quickly calculate how much you need to tip a waiter for a specified percentage (usually 15% unless you are cheap!). This program was written in XCode using Swift 3 and supports iOS version 10.2 or higher. 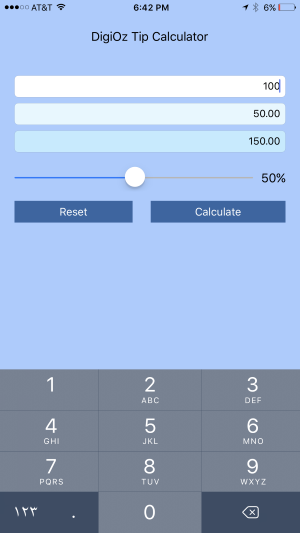 The DigiOz Tip Calculator is an application that allows you to quickly calculate how much you need to tip a waiter for a specified percentage (usually 15% unless you are cheap!). This program was written in Eclipse IDE using Android Development Tools and supports Android version 2.1 or higher. 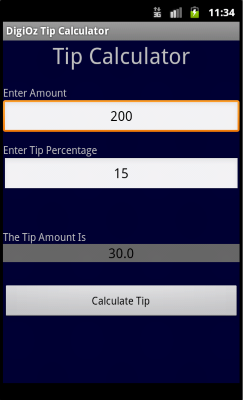 The DigiOz Tip Calculator is an application that allows you to quickly calculate how much you need to tip a waiter for a specified percentage (usually 15% unless you are cheap!). This program was written in Visual Studio 2010 using Windows Phone 7.1 SDK and supports version 7.0 or higher. The DigiOz Pocket PC Temperature Converter is an application that converts temperature from various units such as Fahrenheit, Celcius and Kelvin from and to each other. This Program was written in C# .NET 2.0 and is designed to work on Windows Mobile with .NET 2.0 compact framework installed on the device. To install, simply transfer the Mobile CAB file to your Pocket PC and run it.